Ockham’s Razor (also written as Occam’s Razor) is based on one of the guiding principles of Skepticism, the principle of parsimony, which suggests that the simplest answer tends to be the best. This is not the same as suggesting that the most simplistic answer tends to be the best. Take the light bulb for instance. Offering, "it's magic!" as an explanation for how it works might seem like a much more simple explanation than having to explain electrons, photons, electricity and filaments. But, the reality is, that invoking magic introduces many more questions than it answers. What is magic? How does magic work? What is the mechanism? Is it measurable? Is it observable? Is it governed by physics? Ockham's razor instructs us to choose the answer that requires the least amount of speculation. Atoms and electricity may seem complicated, but they are at least well understood (by someone other than me), whereas "magic" is pure speculation. 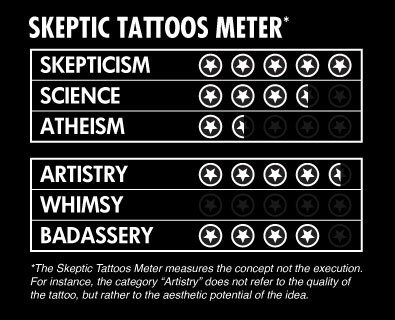 The tattoo gets high marks on the Skeptic Tattoos Meter because it is based on a razor which can look dangerous and menacing. The Latin on the banner in the tattoo says, “plurality non est ponenda sine necessitate” which translates to, “plurality is not to be posited without necessity.” Most Ockham tattoos are illustrated as straight razors (including mine) because they look timeless and cool, but, the truth is that something like a scalpel would probably be closer to the intent of Ockham’s Razor, since it is useful for trimming away the fat of an argument. Learn more about Ockham's Razor. Click here to see a gallery of Ockham's Razor Tattoos.